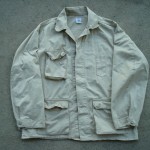 Starting last year again, I have more chance to grab POST O’ALLS BDU jacket whenever I have my shorts on. Here’s a one from late 90s. 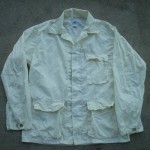 This is our first BDU jacket. I remember I used to wear it frequently with shorts, POST O’ALLS’ old regular climbing pants/shorts( # 1325) or a pair of five pocket jean….with Clarks? Our version differs from its original government issue in some points. 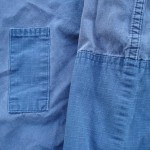 Pocket arragement is inspired by a soldier’s hand modified used one – somebody took its left chest pocket off for some reason, revealing a pencil pocket originally sewn underneith the chest pocket. And maybe I did some minor adjustments on pocket bellows and their directions. In terms of fabrics, original is made of lightweight cotton ripstop, ours used mid-weight cotton poplin with tone-on-tone cotton ripstop pencil pocket and elbow patches. 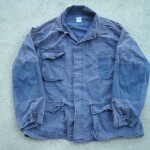 I remember we also had very POST O’ALLSish combo of navy x OD, stone x khaki among other solid color tone-on-tones. Maybe we did some khaki Tiger stripe? I don’t remember correctly…but that would look killer…. Here is our 2011 version. New fit, new pencil pocket shape, less elbow patches……fabric is high-density cotton Supreme twill. Looks more simple than our older version. 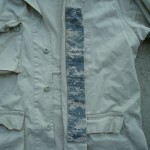 Plus, we added a digital camo front fly strip…..our familiar fabric some years ago. And, here’s our 2012 model sample.